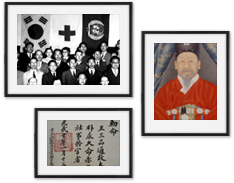 Following the Korean empire’s signing of Geneva Conventions I and II in 1903, Emperor Gojong established the Red Cross society in Korea in 1905. With Japanese colonisation of the Korean peninsula in 1910, it moved to Shanghai where the provisional government was established in 1919. After the end of the colonial era in 1945, the Republic of Korea officially reformed it as the Republic of Korea National Red Cross (or currently more known by its abbreviation, “Korean Red Cross”) in 1949. Our first major relief operation was for war victims during the Korean War that lasted from 1950 to 1953. Since then, we evolved to become a major humanitarian organisation to the Korean people and major humanitarian partner to our government, especially in disaster response, blood service and inter-Korean humanitarian issues. Today, we run programmes in disaster preparedness and response, blood transfusion, relief and development in foreign countries, first aid and safety, restoring family links, IHL and much more (in detail below). Among these, our blood service is by far the most expansive and widely recognised, after being entrusted by the government in 1981 to oversee the nation’s entire blood service. All our programmes and services are guided by the Movement’s fundamental principles of humanity, impartiality, neutrality, independence, voluntary service, unity and universality. Korean Red Cross is headquartered in Seoul, the nation’s capital, and operates a total of 5 hospitals, 14 chapters and 131 blood donation centers.